Makerspaces are not just about robots and virtual reality - critical making can also include low tech objects like small, self-published magazines, known as zines. 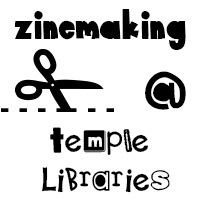 Come to this hands-on workshop series to make zines using found and original images and text, scissors, paper, and your favorite adhesives. You'll also get to handle zines from the Libraries’ collections, and learn why zines are still important in 2018. All materials provided. There will be four workshops in this series. You are not required to come to every one, but each workshop will build on the last, so consistent attendance is encouraged.